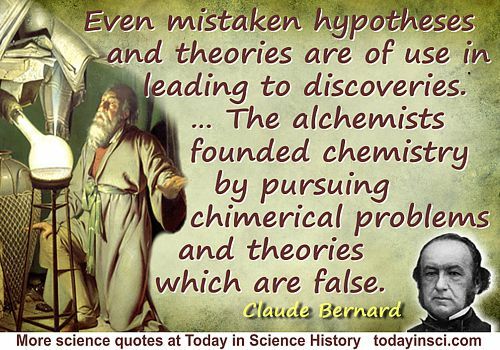 A basis of physical science no more justifies dogmatism than a metaphysical basis does. 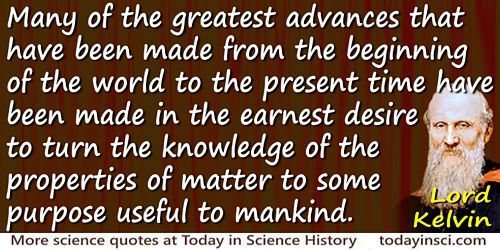 In physical science the discovery of new facts is open to every blockhead with patience, manual dexterity, and acute senses; it is less effectually promoted by genius than by co-operation, and more frequently the result of accident than of design. In Review of 'An Account of the Life, Lectures, and Writings of William Cullen, M.D. Professor of the Practice of Physic in the University of Edinburgh', The Edinburgh Review (1832), 55, 461. By Thomas Henry Huxley and Henrietta A. Huxley (ed. ), Aphorisms and Reflections (1908), 80. 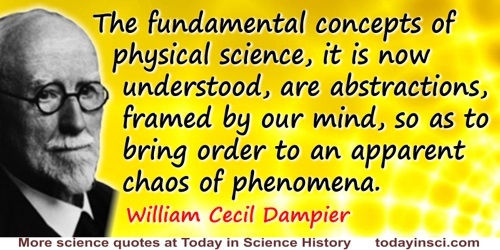 Neither physical science nor psychology can ever ‘explain’ human consciousness. To me then, human consciousness lies outside science, and it is here that I seek the relationship between God and man. In Can scientists believe? (1991), 8. 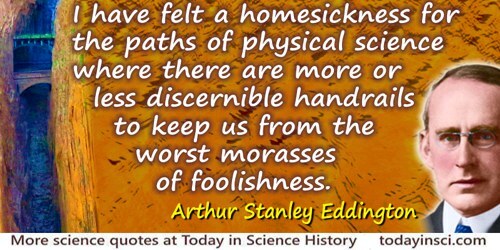 Physical scientists probably deserve the reputation they enjoy for incorruptibility and unswerving devotion to pure truth. The reason for this is that it is not worth while to bribe them. 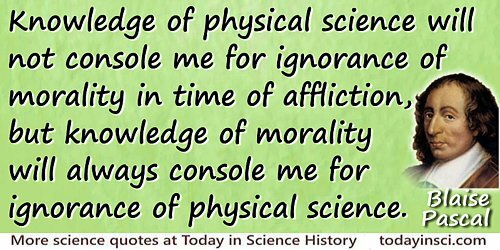 In Science is a Sacred Cow (1950), 168-69. Swarthmore Lecture (1929) at Friends’ House, London, printed in Science and the Unseen World (1929), 73. 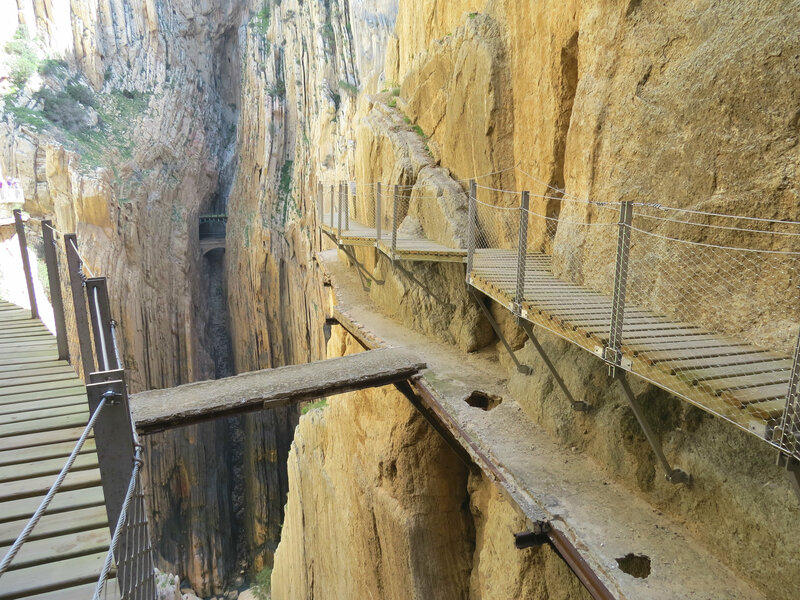 We find ourselves, in consequence of the progress of physical science, at the pinnacle of one ascent of civilisation, taking the first step upwards out on to the lowest plane of the next. Above us still rises indefinitely the ascent of physical power—far beyond the dreams of mortals in any previous system of philosophy. Lecture (1908) at Glasgow University. Collected in The Interpretation of Radium: Being the Substance of Six Free Popular Experimental Lectures Delivered at the University of Glasgow (1912), 252. 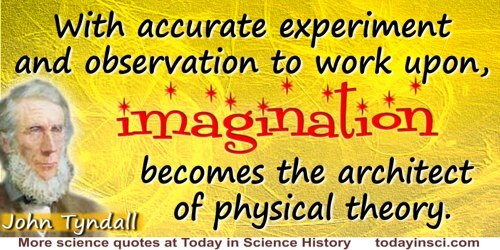 With accurate experiment and observation to work upon, imagination becomes the architect of physical theory. In discourse delivered before the British Association at Liverpool (16 Sep 1870), 'Scientific Use of the Imagination', collected in Fragments of Science: a Series of Detached Essays, Addresses and Reviews (1892), Vol. 2, 104. [The religion of science was] an implicit faith that by the methods of physical science, and by these methods alone, could be solved all the problems arising out of the relation of man to man and of man towards the universe. In My Apprenticeship (1926), 89.